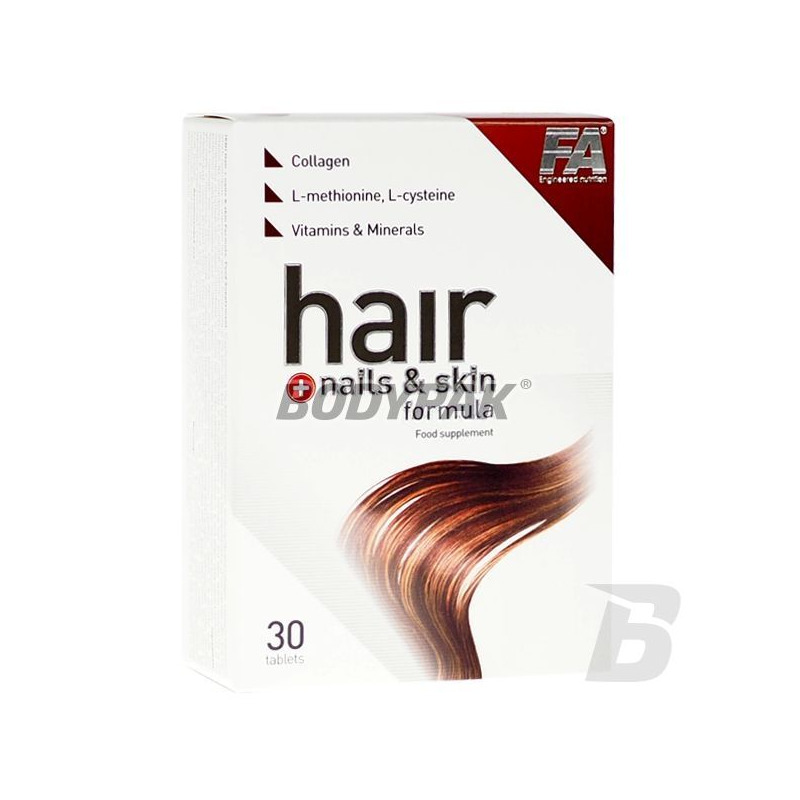 Health & BeautyFA Nutrition Hair Formula - 30 tabl. FA Nutrition Hair Formula - 30 tabl. Condition of skin, nails and hair says a lot about the state of our health. The rush of everyday life often leads to their destruction and accelerates the aging process. Take care of your youth, take care of your beauty! 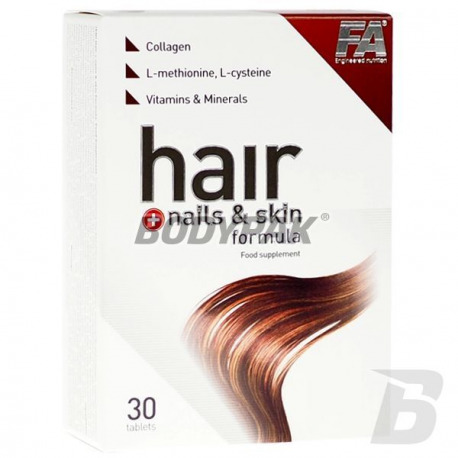 FA Nutrition Hair Formula is a comprehensive supplement supplementing the diet with vitamins, minerals, amino acids and natural collagen, which provides components that help in the proper functioning of the skin, hair and nails. The product was created especially for women for whom a healthy and beautiful hair, skin and nails is the basis of well-being and self-esteem. FA Nutrition Hair Formula will make you enjoyed a perfect and healthy appearance! The rush of everyday life makes you forget about your own health care - just have found a way to quickly and effectively support your body! Skin, hair and nails say a lot about the health of our body. Nail appearance, color, shape, thickness, carries a lot of information about our health. Well-groomed hands and emphasize the beauty of their appearance and shape can affect eating disorders, nutritional deficiencies, metabolic diseases and internal organs, and sometimes external factors such as humidity and temperature. Lack of valuable minerals and vitamins in the diet causes adverse changes in the appearance of the nail. They become dull, brittle, delaminate and are susceptible to various diseases also appear in white spots and stripes on the nail plate. When nails are dry frangibly covered grooves, i.e., they lack the biotin required for proper construction of the board. Deficiency of vitamin C and folic acid can be one of the causes inflammation of the nail. Longitudinal grooves on the nails, which look as if was breaking the nail may indicate a deficiency of vitamin B. Pale nail plate may suggest anemia. If anemia persists long nails can start to break, change shape, become completely flat. The cause of white spots on the board may be a lack of zinc. Longitudinal grooves on the nails, which look as if was breaking the nail may indicate a deficiency of vitamin B. Dry, flaky skin - can be a symptom of various dermatological conditions, but also the result of vitamin A deficiency (involved in the synthesis of collagen and is responsible for the proper functioning of the epithelium), biotin, iron or zinc. Every woman should be beautiful and well-groomed hair - thanks to the FA Nutrition Hair Formula is possible! It often happens, however, that the hair lose luster cease to fall into place, they begin to fall out. This may be a sign that something is wrong inside our bodies and very often it is badly chosen diet and the resulting lack of good quality protein, minerals and vitamins appropriate is the reason. No good enough protein in the diet can cause the pad will disappear, and the sheaths become thinner. That is why it is very important that the protein was wholesome, ie. A well-balanced composition of amino acids. Such a protein found in fish, meat, soy protein, or in groundnuts. Most important for hair amino acids are cysteine, methionine and tryptophan. Dry brittle hair testify primarily about the shortage of zinc and vitamins B5 and B6, and alopecia may indicate iron deficiency. Copper deficiency leads to discoloration and structural changes in the hair. Shark cartilage provides a complex of mukopolisacharydowy containing natural collagen in conjunction with chondroitin sulphate. These are the ingredients that includes our skin, nails, hair, ligaments, tendons, joints and blood vessels. Fish collagen is a natural protein derived from fish skin. Collagen is the main protein in the human body, as it represents 30% of the total human protein mass and 70% of skin proteins. Collagen is the main constituent of the skin, nails, hair, ligaments, tendons, joints, cartilage and bone, and blood vessels. The collagen fibers provide flexibility, elastics and also high strength of many structures of the body, including skin, hair and others. L-cysteine ​​and L-methionine is a special sulfur amino acids that make up the "bridges sulfide", responsible for the structure and strength of hair and nails. They are part of the collagen responsible for skin elasticity and creatine - building blocks of hair and nails. Vitamin C helps in the proper production of collagen in order to ensure the proper functioning of the skin, helps to protect cells against oxidative stress. Vitamin E helps protect cells from oxidative stress. Vitamin B2 helps to maintain healthy skin, helps to maintain normal iron metabolism and helps protect cells from oxidative stress. Niacin helps maintain healthy skin and helps to maintain the proper condition of the mucous membranes. Vitamin B6 is a very important vitamin that helps maintain proper metabolism of homocysteine. Folic acid is involved in cell division, helps in the proper functioning of the immune system, helps the correct synthesis of amino acids and helps in maintaining proper metabolism of homocysteine. Vitamin B12 plays a role in cell division, contributing to the proper functioning of the immune system, it helps in the proper production of red blood cells and helps in maintaining proper metabolism of homocysteine. Biotin helps maintain healthy hair and skin. Involved in the metabolism of proteins and fats, participates in the synthesis of fatty acids and the absorption of vitamin C.
Copper is an element that helps maintain a healthy skin pigmentation and hair and helps maintain normal state of tissues. It helps in protecting cells from oxidative stress and helps in the proper functioning of the immune system. Zinc helps maintain healthy hair, skin and nails. Helps to maintain normal metabolism of vitamin A. It helps in the proper synthesis of proteins, DNA, is involved in cell division, it helps to maintain normal metabolism of proteins, carbohydrates and fats. In addition, zinc helps in the proper functioning of the immune system and helps protect cells from oxidative stress. Grape seed extract, as well as vitamins C and E are natural antioxidants that help protect human cells against oxidative stress. In addition, vitamin C helps in the proper production of collagen in order to ensure the proper functioning of the skin. Table 1. during the day. Ingredients: Shark cartilage, fish collagen, fillers (tricalcium phosphate, microcrystalline cellulose), L-cysteine, vitamin C (L-ascorbic acid), zinc gluconate, L- methionine, silicon dioxide, anti-caking agent (E464, magnesium stearate) , Tablet coating [(hydroxypropylmethylcellulose, polydextrose), dyes (red iron oxide, black iron oxide, yellow iron oxide, titanium dioxide), talc, maltodextrin, triacerylglycerol (MCT)], grape seed extract (Vitis vinifera L Niacin (nicotinic acid amide), pantothenic acid (calcium D-pantothenate), copper sulfate II, vitamin B6 (pyridoxine hydrochloride), vitamin B2 (riboflavin), vitamin B1 Thiamine hydrochloride), vitamin B12 (cyanocobalamin), folate (pteroylmonoglutamic acid), D-biotin. Swanson Chlorophyll - 300 kaps.